One Plus 5T launched just a few months ago. Chinese Smartphone maker OnePlus will launch its flagship Smartphone Oneplus 6 this year. It is expected that the company will launch it by May or June. 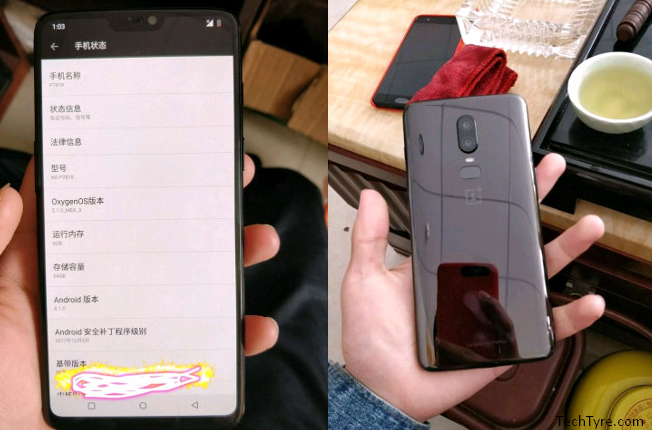 Pictures of Oneplus 6 were leaked earlier but this time the alleged picture leaked is real. Chinese social media website posted this leaked photograph to Vibo. The picture appears in the picture as the iPhone X there is space in upper side of the display where the sensors are engaged. Asus has also launched Zenfone 5 which is claimed to be similar Nokia X. This time the display of this device will be larger and it will be cover 90 percent of front area of device. You can unlock One Plus 5T by face unlock software feature. One Plus 6 can be more precise or we can say it may have face-to-face facial recognition features. Looking at this alleged image it can be estimated that this time the company will bring a mirror finish smartphone. The fingerprint sensor is provided on the rear panel. The logo of Oneplus 6 is given on the rear cover of this image. After some time these pictures were removed from the vibes website but before that people saved it and now they are being shared everywhere. This time the CEO of the company has said nothing about this rumors because first they had been leaked earlier when asked they replied it were fake images. Apart from some Alleged leaked photographs there is currently no information about the specifications and features of Oneplus 6. But there are some things that you will definitely want in it. One of them is the processor, as of now the Qualcomm’s flagship processor Snapdragon 845 used, so in Oneplus 6 the company can give this same processor. In the Oneplus 6 the company can launch it with Android Oreo Basic software. Dual cameras are available in One Plus 3T and we can except dual camera setup Oneplus 6 too.